Fireplaces serve many purposes. They offer warmth, they can be a great gathering place or focal point in a room, they can be a beautiful architectural element of a home and it can be quite relaxing to sit near one during the cold, winter months. But they can also be a serious fire hazard if not properly cared for. 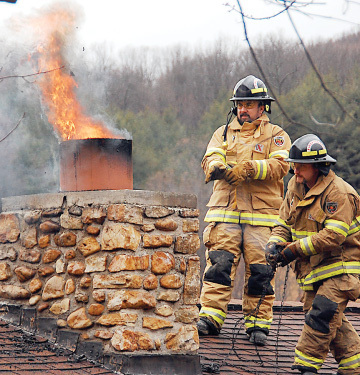 One of the biggest concerns when it comes to fire prevention in your chimney is creosote. Creosote is a an element that occurs naturally as a byproduct of burning wood. Should the creosote buildup go unnoticed, it becomes a dangerous fire hazard. Buildup of creosote can also result in carbon monoxide poisoning as the chimney becomes obstructed. Utilizing the services of a certified chimney sweep is important to keep creosote buildup to a minimum. Check the Chimney Safety Institute of America to locate a CSIA Certified Chimney Sweep®. Make sure the chimney has been cleaned and inspected before you purchase a new property that has one. If it has not, do not use it until you schedule an inspection yourself. Screen your fireplace. This keeps sparks and embers from escaping and keeps pets and family members safe as well. Do not go to bed or leave the house with your fireplace running, even if it has a screen. Wait until all embers are extinguished. Keep all branches and leaves at least 15-feet away from the top of your chimney. Cap your chimney! This will make sure that debris and animals such as squirrels and birds stay out of your chimney. Choosing the right fuel is important. For burning firewood in wood stoves or fireplaces, choose well-seasoned wood that has been split for a minimum of six months and stored in a covered and elevated location. Never burn Christmas trees or treated wood in your fireplace or wood stove. Never use flammable liquids to start your fire. Use kindling or a commercial firelighter to ignite firewood or firelogs that you've arranged at the rear of the fireplace. Keep furniture and other items at least 3-feet away from the fireplace. Install smoke and carbon monoxide alarms throughout your home and test them regularly to make sure they are in working order. Get your fireplace inspected annually by a certified chimney sweep.